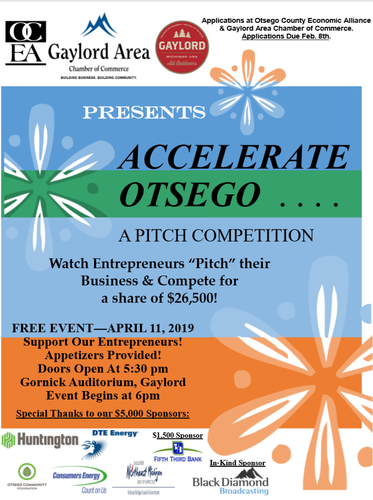 The Otsego County Economic Alliance, Inc. (OCEA), Gaylord Area Chamber of Commerce and the Gaylord Area Convention and Tourism Bureau have partnered to launch Otsego County’s first pitch competition. “Accelerate Otsego” is a combined effort to grow entrepreneurship by providing business plan development and pitch assistance. This will culminate in a pitch night on April 11, 2019 at the Gornick Auditorium in Gaylord where competitors will vie for over $26,500 in award funding to assist their businesses. Applications are available beginning January 21, 2019 at either the Otsego County Economic Alliance’s office located in the Otsego County Courthouse building on Main Street, or the Gaylord Area Chamber of Commerce office located on Main Street. Applications will be accepted through February 8, 2019 and require a $50 non-refundable application fee to assist with program expenses. The program will begin February 18, 2019 where representatives from the Small Business Development Center and mentors from SCORE will provide 2 hour assistance one night a week for 5 weeks to help competing entrepreneurs with their business plans and pitch. For more information about this program please contact either the OCEA at 989-731-0287, the Gaylord Area Chamber of Commerce at 98-732-6333 or the Gaylord Area Convention and Tourism Bureau at 989-732-4000.